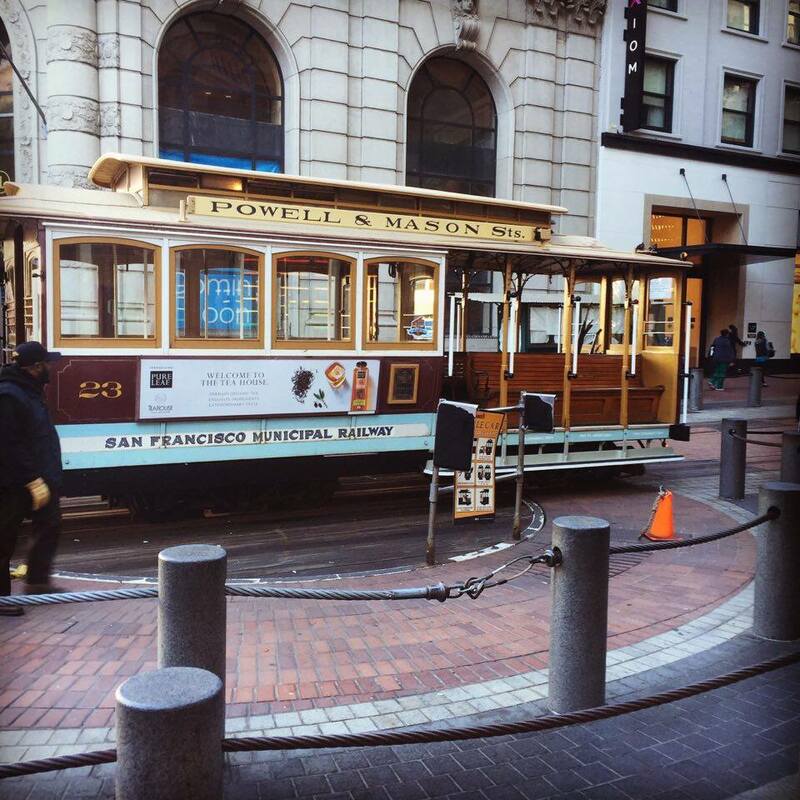 Last week was a whirl wind of activity in San Francisco, CA where DevNation and Red Hat Summit 2016 took place. While the weather was less than ideal with temperatures remaining rather on the fresh side, the activities kept us all running around to catch up on the latest news around Red Hat Open Source technologies. As previously covered, I was scheduled to give a talk and help host a lab. Along with that I also had two different booth duty slots to cover where I got the chance to talk with many friends from near and far, while along the way I met new friends. There was also an afternoon spent talking to industry analysts around the various aspects of the Red Hat Cloud Suite product. Mixed into that were countless chats, gatherings at a restaurant or pub in the vicinity where you get to catch up with the old guard at Red Hat. The final thing on my agenda was hosting an EMEA Cloud gathering with drinks and dinner, time used to get a feel for the home front before returning to that region later this summer. This was the opening day for DevNation, where you get the chance to register and mingle with all manner of colleagues that just seem to pop up from everywhere in the world to say hi. It is probably my favorite day of the entire show, as nobody is ramped up to talk yet, everything is still possible and you see the anticipation on every face. I spent time talking to friends from EMEA, APAC, NA and LTAM as they would appear and shout out, "Eric!!!" before a chat, hug and much back clapping. Who doesn't like moments like that? 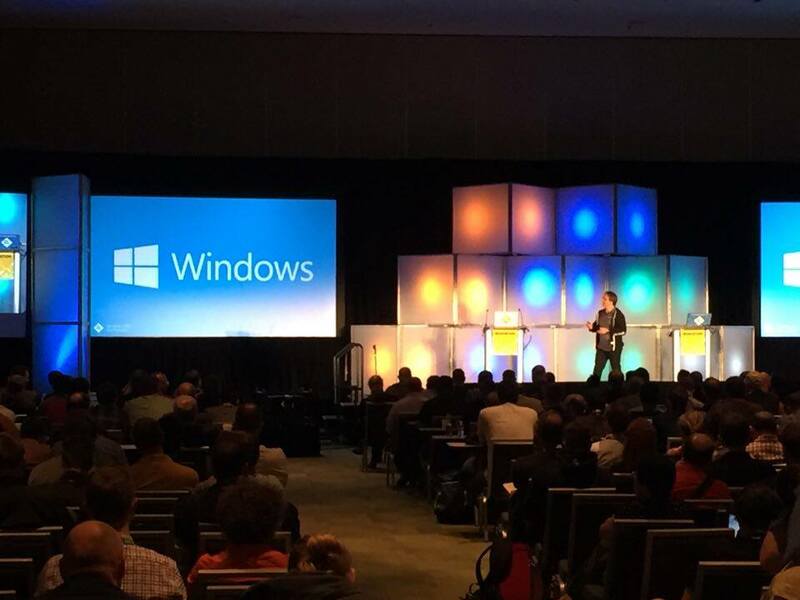 The DevNation keynote was a good showcase with quite a few surprises, such as the announced release of JBoss EAP 7, the launch of a new community called MircoProfile and a rather large demo showcase of .Net on RHEL.... I mean who would have thought, right? After this it was time for lunch and catching up with the JBoss jBPM / Drools team as we watched DevNation lightning talks on all manner of topics. Always nice to see our rock star engineers and get a peak at what they are up to these days before it goes live. 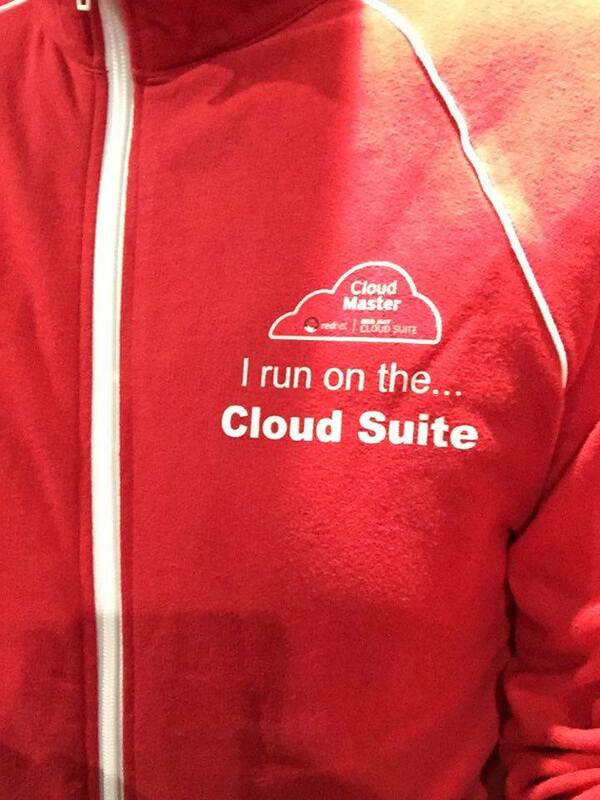 I had to head over to the Red Hat booth and make sure that everything was ready, including all the SWAG we had for attendees and the demo pod with no less than four (4) exciting live use cases for Red Hat Cloud Suite. Then it was off to the Giants baseball game with a group from APAC and NA, which is always a nice way to collaborate, chat and enjoy the greatest game on the planet... well, at least I think so. If you were wondering, the Giants lost. 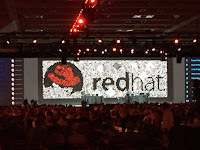 This is the start of Red Hat Summit with the theme this year being "The Power of Participation", so it opened with a keynote by CEO Jim Whitehurst the resonated well on this theme. In the mean time, I had to run out early on the keynote as my talk with a partner was in the first slot right after the keynote in another building a block away. No time to run from keynote to my talk, so setup early while the attendees moved from one building to the next for our session. We gave a talk called Partners in Crime and outlined our work with JBoss BPM Suite and Signavio. It also showcased a demo of the current progress being made around designing BPM processed with Signavio tools that are then integrated into the JBoss BPM Suite. 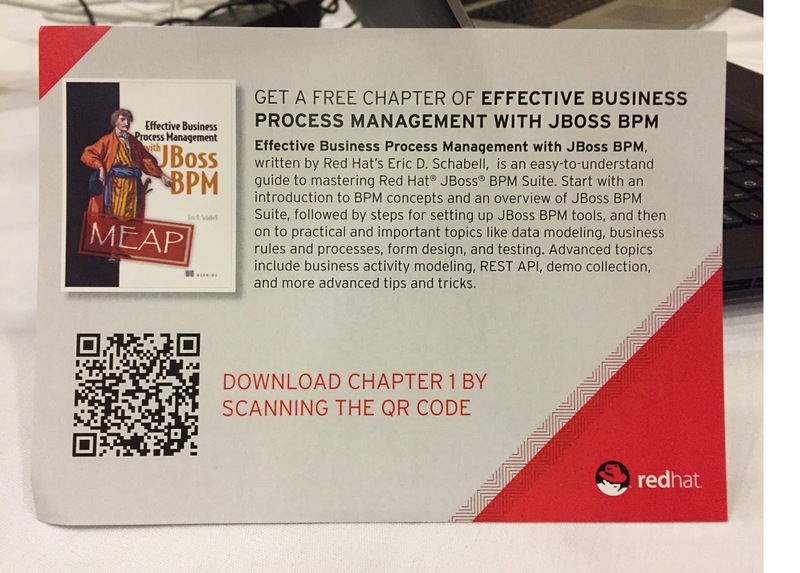 There was also interest in my new book's early access program and all week I was able to push people to the JBoss BRMS & BPM Suite booth for a postcard with a scan code for a free chapter from Effective Business Process Management with JBoss BPM. Following the talk, I was due to appear for my first booth duty as the partner pavilion where it was busy at all the pods, not just our Red Hat Cloud Suite pod. We gave out many t-shirts, stickers, mint cases and had great chats around the products as attendees showed their interest in sharing their experiences using these technologies. 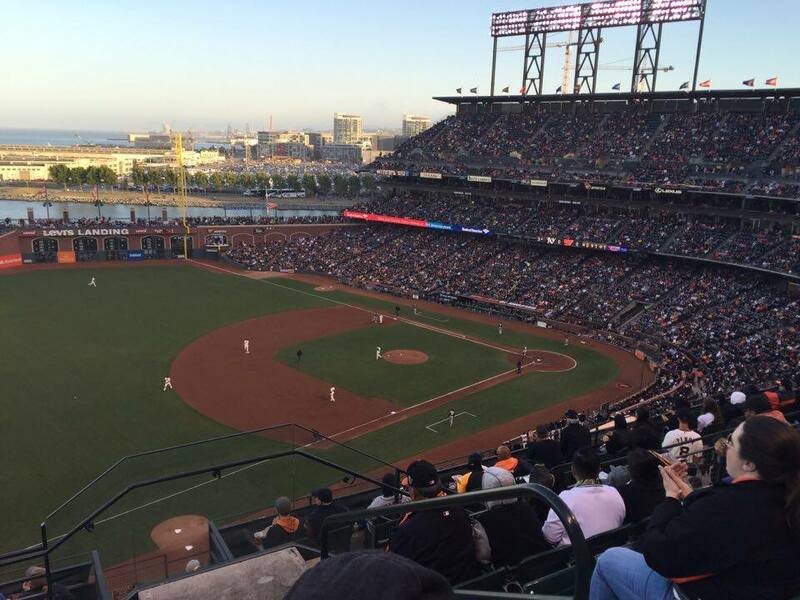 The evening was another gathering at the ballpark for another Giants game with partner Signavio. It was a cold evening with lots of wind so we did not stay until the end, but instead got a chance to catch some sleep before the early 5k run the next morning. At 05:30 the alarm went off and had to hustle down to the Moscone Center for the start at 06:00 of the Summit 5k. A nice jog with colleagues and customers around the bay front and baseball stadium before heading back for work at the Red Hat Summit. This was the morning of the big keynote where Burr Sutter and company did the yearly Red Hat technology showcase demo live on stage. This year they included products from OpenShift, JBoss BPM Suite and JBoss EAP 7 along with some community projects to provide a DevOps CI/CD end to end demonstration from dev to mobile with visual aids for the crowd. 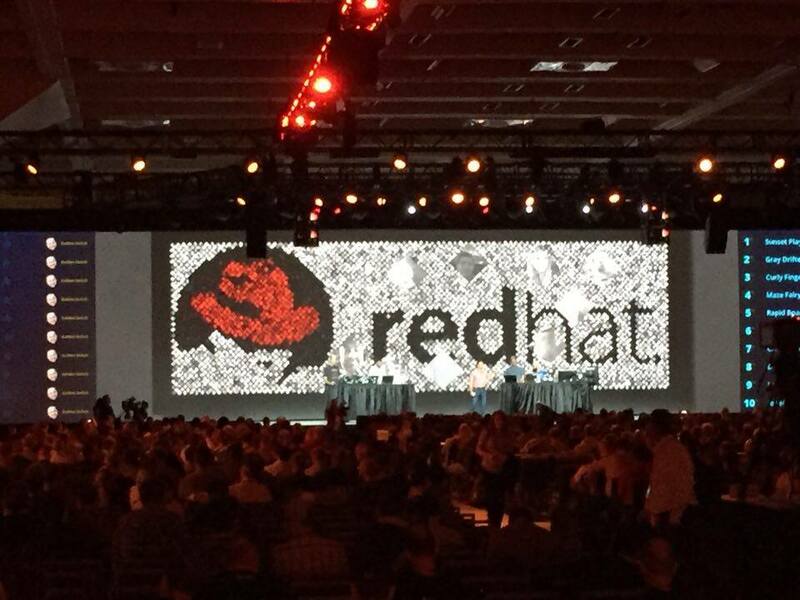 A very nice story around what Red Hat technologies and products can do for enterprises. 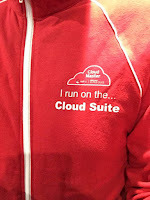 Then it was back to the booth for more chats, where the t-shirts where flying out the door and a lot of interest again in the Red Hat Cloud Suite product. We spent a bit of time on the white board too, which brought the interest right out of the passant attendees! In the late afternoon I stopped by, together with the colleagues whom I was hosting a lab with the next day, the room to test our our environment one last time before the big day. All was well so headed out to a team dinner with the Integrated Solutions Business Unit before calling it a day. 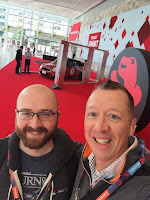 As a nice example of how fun and crazy a day can start at Red Hat Summit, I walked into the presentation and photo session with the winner of the Mini Cooper give away promotion for JBoss EAP 7 launch! After a quick selfie with the winner I was off to host our hands on lab with OpenShift, JBoss Fuse and JBoss BRMS. This took up most of my day and afterwards I spent time with another friend to plan our our demo work the coming months, so keep an eye on Red Hat Demo Central for some cool AppDev in the Cloud activities. The Red Hat Summit closed out for me with a gathering of EMEA Cloud Solution Architects to catch up on who is around when I head back to EMEA later this summer. We had drinks and dinner before some headed to the closing party. It was a great week, a good time, tiring and exhilarating all rolled into one. There is nothing quite like it, so, see you at DevNation & Red Hat Summit 2017?